With the grand opening festivities of Uniqlo‘s San Francisco flagship opening out of the way this weekend, I figured I could dodge the crowds and pop into the famed Japanese retailer’s first West Coast store today in Union Square to grab a few staples. Boy was I wrong. Known for their well-cut basics (think Japanese version of Gap), I’ve never had trouble finding an assortment of trim-fitting, quality sweaters, pants, and tops– in every color of the rainbow– when shopping at Uniqlo’s New York and Asia outposts. It also happens to be a great place to find pieces cut for those with more petite frames as sizes run smaller than those of typical American retailers. 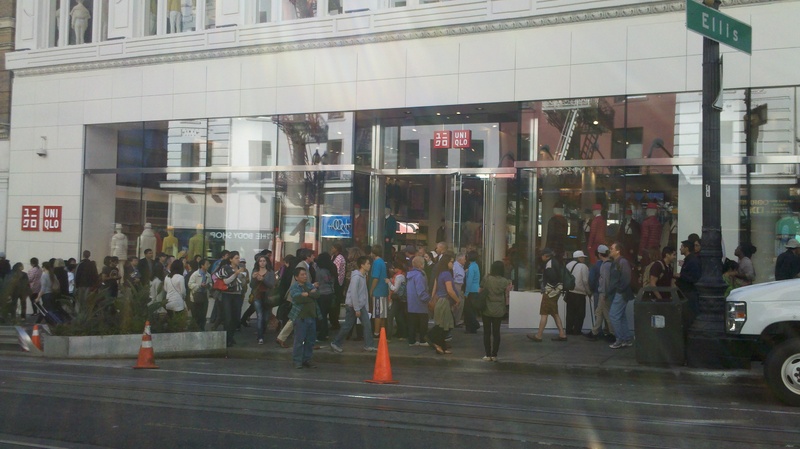 Here’s a snapshot of the insane line outside the 111 Powell Street mega-shop this afternoon that wrapped half-way around the block. I guess I’ll just have to wait until the madness dies down to stock up! (Tip: For those of you unwilling to hoof it to the brick-and-mortar location, Uniqlo.com will soon be available to US shoppers. To get notified of exactly when, pre-register on the site with your email address). Copyright 2012 Nerissa Pacio Itchon, except where noted.